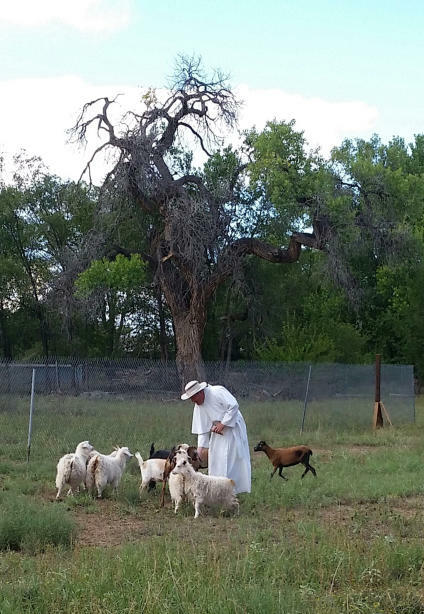 St. Edwin is proud to have five Navajo-Churro Sheep. The breed was originally brought by the Spaniards to the New World in the sixteenth century. Since then they have gone extinct in Spain but survive in New Mexico and other parts of the southwest. Navajo-Churro Sheep are hardy, disease resistant, and easy to care for. They are ruddy with blended white, black, and dark brown features. Navajo-Churros have a double-fleece coat offering them warmth in the cold winter months. Their wool is prized. We ourselves have one beautiful horned ram and four darling ewes. They typically give birth around December. Above is our ram, the carnero or macho borrego of our flock. The children submitted names for him and voted for “Copper.” He doesn’t seem to mind his offspring playing on his back. Pictured above are our four Navajo-Churro ewes and another ewe, the female hembras borregas of our flock. The children named them “Bella,” “Cotton Candy,” “Lola,” and “Angel.” They are shy and keep to themselves, but learn the customs of the ranch and follow the directions of their caretakers. Above to the right of the Navajo-churro sheep are few of our assorted animals. There are other sheep and various goat-does. A buck visits the does in November after which follow the kid-goats five months later. The children in our parish will have an opportunity to bottle feed some of them. Fr. Peter rewarding the goats with sweet grain after a successful photo-op. South Valley inhabitants are no strangers to ranching. The parish property itself was once a ranch. The various animals we keep on our property provide character, fun, and community bonding to our parish. Right now we have sheep and goats; parishioners would like a few chickens. Above are our new shed-stables. SEE LAMBS & MORE LAMBS HERE! In April of 2018 we sheered our sheep for the first time. The sheep seem to like it, running around afterwards like children with new sneakers. We brought their fleece to New Mexico’s Mora Valley Wool Mill, the largest wool processing plant west of the Mississipi. Below are bags of “roving,” the scoured, carded, and combed wool ready for spinning. We are trying to figure out what to do next. Any spinners in the house? St. Edwin is proud to have five Navajo- Churro Sheep. The breed was originally brought by the Spaniards to the New World in the sixteenth century. Since then they have gone extinct in Spain but survive in New Mexico and other parts of the southwest. Navajo-Churro Sheep are hardy, disease resistant, and easy to care for. They are ruddy with blended white, black, and dark brown features. Navajo-Churros have a double-fleece coat offering them warmth in the cold winter months. Their wool is prized. We ourselves have one beautiful horned ram and four darling ewes. They typically give birth around December. Above is our ram, the carnero or macho borrego of our flock. The children submitted names for him and voted for “Copper.” He doesn’t seem to mind his offspring playing on his back. Pictured above are some of our four Navajo- Churro ewes, the female hembras borregas of our flock. The children named them “Bella,” “Cotton Candy,” “Lola,” and “Angel.” They are shy and keep to themselves, but learn the customs of the ranch and follow the directions of their caretakers. South Valley inhabitants are no strangers to ranching. The parish property itself was once a ranch. The various animals we keep on our property provide character, fun, and community bonding to our parish. Right now we have sheep and goats; parishioners would like a few chickens. Above are our new shed- stables.